On Saturday, the Supreme Electoral Committee announced that 98.1 percent of Egyptians voting in last week's referendum on the new constitution approved the amended national charter, with a turnout rate of 38.6 percent. The following table shows official results of Egypt's 2014 constitutional referendum. The table also includes the results of the 2012 constitutional poll. *"Inter-Govern. Voters" are voters residing outside of their registered governorates. 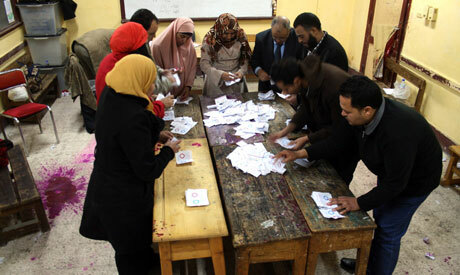 The Egyptian government allocated special polling stations where they could cast their ballots. 68.4% boycotted....This means that nearly 74 million Egyptians had nothing to do with the referrendum. Besides, tyhose who overthrew a democratically-elected president can not be entrusted to organize honest elections. Do the new dictator, a Mubrik' replacement can fool the world? I feel sorry for Eyptians who three years ago got the fruit of democracy but lost by the complicities of Israel, USA and Saudis. May Allah give them wisdom and bring them back on the road to democracy and peace, not only for Egypt but for the neighbours particularly Palestinians (especially of Gaza, who are betrayed by their so called "Arab brothers"). No need to hide behind a fake Greek name or a fake professorship claims. Your drivel screams Muslim brotherhood terrorists propaganda. All elections or votes for referendum do not get 100% participation especially when your ilk is terrorizing the voters. Hate to burst your bubble but non participants intentionally or unintentionally do not determine a referendum of any kind. So Morsi's constitution is more void! It passed by only 32% of the population and got 64% of the vote. So Morsi is more illegitemate, especially that 20 millions voted for 2014 constitutiom and only 9 millions to Morsi's! Dear Mr Expert, Where were you when Morsi's constituion was passed and had a turnout of 33% and only 64% voted "Yes"? Now you have 38% turnout and 98,6% voting "Yes". And you are now screaming loud saying "not valid".So you were happy with the 11 million who voted for Morsi's constitution and not happy with over 21 million who voted for the 30 of June revolution referendum?